Taste test: This is regular air-popped popcorn (the yellow kind), with the added benefit of having black pepper on each piece. At first I didn't like it, I thought the pepper was too strong, but after a few handfuls of it I started to appreciate the taste and enjoyed the bag. The snack leaves a pepper aftertaste in your mouth (slight heat), so you might want to cleanse the palate with some water or a soda after a while. 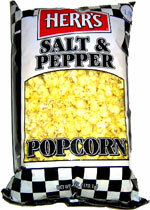 We think Herr's might have a new hit on their hands, combining pepper to popcorn isn't such a radical idea, after all, and the taste might catch on! Smell test: This smells like pepper, with a slight buttery popcorn aroma. This snack was discovered by Keith and Melissa in Delaware. Review published .